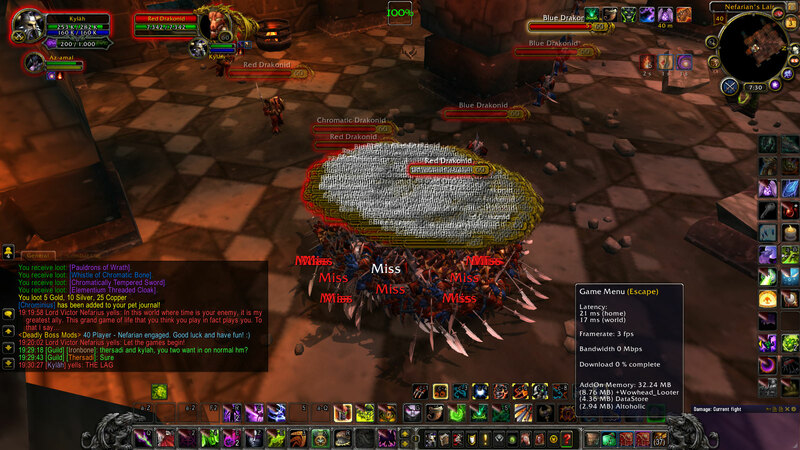 Now that Cataclysm is out the fight has changed, a lot. You no longer need the Onyxia Scale Cloak at all -so you don't have to hide behind the throne any longer. The debuff will not kill you on the last tick, hurray for that! I kept the old post for historical purposes, in spoiler tags. If you do not have the Onyxia Scale Cloak you can manage this event with a minimum of 1 tank and 2 healers (+some dps, the more the faster/easier for healers). The shadow flame ticks around 1k dmg -no problem what so ever but at the end at the debuff it deals 16k damage! This means the tank needs to be on full health (at least over 16k hp) before debuff runs out! (And the only one standing in-front getting the shadowflames) Just have the tank capped off and its easy to survive. The more dps you bring along, the less healing you have to do as well! Blackwing Lair is the only way to get most dragonscales anymore, especially Black Dragonscale, which some choose to make some nice transmog items with. 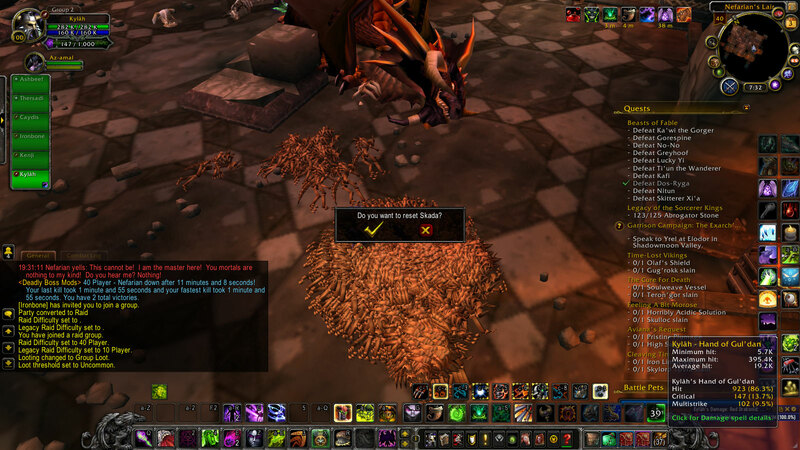 This scarcity of scales is because Upper Blackrock Spire's black dragons were removed, and most remaining dragons in Azeroth have had their levels altered so that they no can longer drop scales adequately. Lastly, Nefarian drops some incredible recipes, and not too uncommonly either. I have had a huge variety of these loot-list items drop, and they are even more difficult to come by in the world anymore because of aforementioned level scaling. He can also drop Orb of Deception, which have upped in value since they became a toy. Blindfold will turn your screen black for a few seconds. Note that this does not seem to affect your chance to hit, but it's nice that Nef acknowledges and considers our newest classes, to this day. Nefarian is the eighth and final boss of Blackwing Lair. He was particularly notable back in the day for his class calls, so much so that when Blizzard added death knights to the game, they went back and added a class call to Nefarian as a tribute. Every 25-35 seconds, he will "call out" a class, afflicting every player of that class with a specific debuff. Druids are forced into Cat Form for 30 seconds by Involuntary Transformation. Death Knights will Death Grip players into him. Hunters have their equipped ranged weapons instantly broken. Mages are transformed into a giraffe, cow, or worm by Wild Polymorph. Priests are afflicted with Corrupted Healing, causing the targets of any direct heals they cast to be debuffed by Corrupted Healing, dealing 44 to 56 damage every 1 sec, stacking up to 50 times. Paladins receive Siphon Blessing, forcing them to continuously cast Blessing of Protection on Nefarian. Rogues are teleported in front of Nefarian and immobilized, leaving them open to his Cleave and breath attacks. Shamans will be under the effect of Corrupted Totems, summoning powerful versions of the Shaman's various totems that will buff Nefarian and damage the raid. Warriors will Berserk, forcing them into a modified , increasing damage taken. Warlocks will be forced to Summon Infernals, summoning two Corrupted Infernals per warlock to start attacking the raid. Nefarian yells: Inconceivable! You may actually defeat my lava worm! Perhaps I can help... tip the scales.